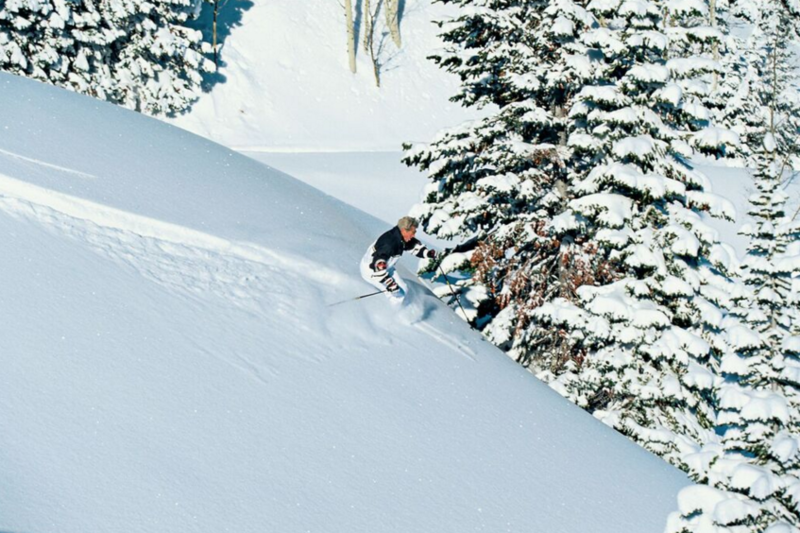 As one of the most recognized names in the ski world, Stein Eriksen has been synonymous with skiing style and elegance for more than 60 years. 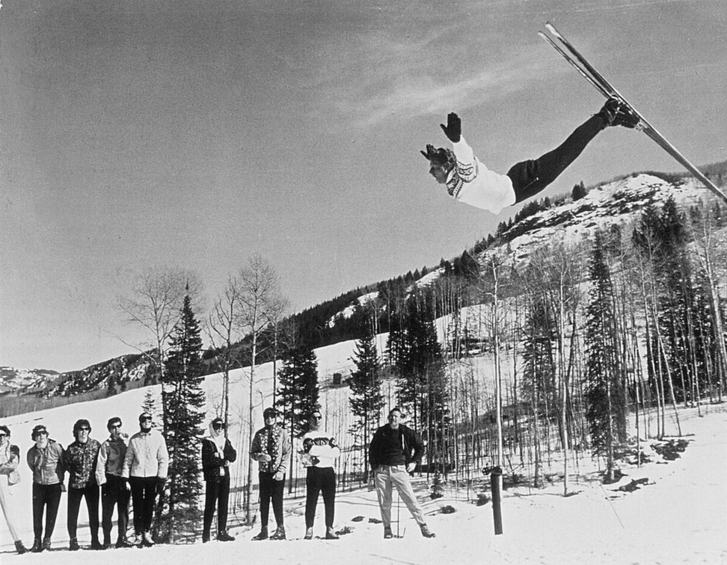 The first alpine skier to win triple gold at a world championship, an Olympic Gold Medalist and ambassador and father of freestyle skiing, Stein Eriksen parlayed all that he knew and loved about the sport into an incredible career that spanned almost six decades and changed the face of alpine skiing worldwide. The patriarch of elegant skiing, Eriksen successfully turned his passion for skiing into a lifetime career. 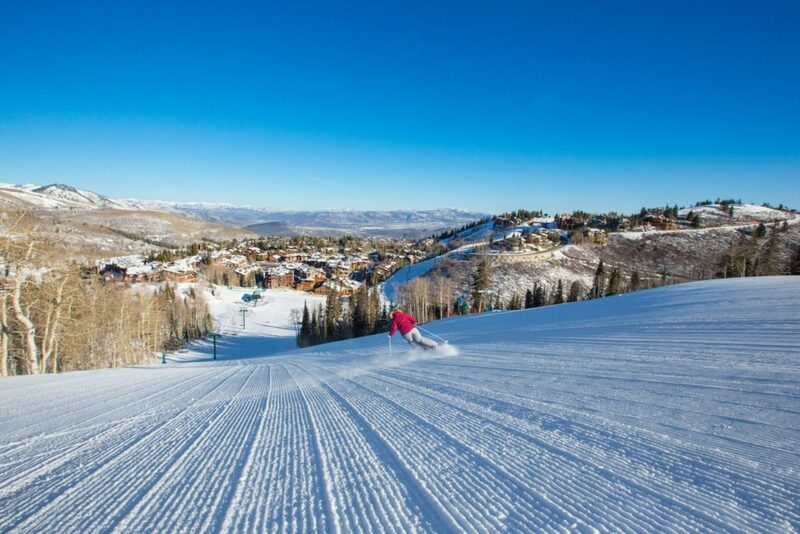 His desire to develop an internationally-renowned luxury hotel, which now bears his name, is located mid-mountain at Deer Valley Resort, where he served as Director of Skiing for more than 35 years. Born December 11, 1927, Eriksen originally gained fame through competition at the 1952 Oslo Olympic Winter Games, where he took the gold and silver medals in the giant slalom and slalom events, respectively. Two years later he went on to win three gold medals at the World Championships in Åre, Sweden in 1954, making him the first alpine skier to win the world championship ‘triple gold.’ Shortly thereafter, Eriksen’s inimitable style and captivating personality garnered him the attention of the news media and friendship of the Hollywood elite. His status was enhanced by his spectacular forward somersault, an aerial maneuver credited as the forerunner of the inverted aerials performed by freestyle skiers today. A native of Norway, Eriksen lived in the United States for the last six decades. Prior to joining Deer Valley Resort, he was involved in the development of the then Park City Ski Area, now Park City Mountain. Before Park City, Stein spent four years as director of skiing and ski school director at Snowmass, Colorado, and four years as ski school director at Sugarbush, Vermont. He also served as ski school director and owned his own sport shop in Aspen, Colorado. From 1956 to 1958, he was ski school director for Heavenly Valley, California, having previously served in the same position at Boyne Mountain, Michigan from 1954 to 1956. Stein was frequently sought out by the thousands of skiers to which he taught the sport and was always happy to stop for a visit and a photo. He took great pride and joy in his past students and guests and making them feel special. In addition to his numerous accomplishments and awards, Stein will be remembered for his charisma, kindness and approachable nature. I have known Stein for many years and have had the pleasure of dining with him on several occasions during the FIS World Cup at Deer Valley. He will be missed by all of us that had the pleasure of knowing him. I had the great pleasure of skiing with Stein for one run down at Boyne Mountain back in 1978 – a moment I will never forget! God Bless and thank you for your great contribution to the sport. Dear Mrs. Eriksen, We only met your husband twice, but both times were memorable My wife and I were skiing in Deer Valley over 10 years ago and we asked a gentleman at the base of the Stein Lodge for some information . I asked him if he could point a good run for us, as we were new to to the area. In his pleasant voice he told us and pointed to one of the runs near the lift and then he mentioned that we could go up to the lodge on top of the hill for a nice lunch. I asked him ” are you Stein Eriksen” and he replied yes. Then I made the mistake in mentioning that his Swedish hockey team was doing great in the winter Olympics…….he just smiled at us. My wife later corrected me and said that Stein was Norwegian. The second time we met Mr Eriksen was in Peter Glen Sports store in Jupiter. I apologize for my error. He took out a beautiful poster of himself skiing in his famous style and he signed it for Ben and Sherry. What a gentleman. I found the information in the computer about his passing. Our condolences to you and your family. In 1980 I skied in his class at Deer Valley. His comment as I took my turn, Vunderful! I will never forget that moment. Stein was my skiing idol. I met him when I was with my family on a ski vacation at Sugarbush. I was ten. I wanted his autograph but all I had was a little bar napkin. He took the napkin, left the room, and came back with a poster of that famous photo we all know and he wrote a little note. Later on we had the rare treat of seeing him do his front flip (on those skis and those “bindings”!!!) While we were eating lunch. I was smitten. I grew up skiing at Boyne Mt Michigan. Everyone was totally stunned at the news that Stein was going to come to Boyne. He seemed destined for a more glamorous life. …and he did have it. While he was at Boyne he was friendly and down to earth…played ping pong with all the kids. He also was responsible for bringing some Austrian Instructors to Boyne….between the accents and the yodeling, we were all enchanted. I met Stein at Streeter and Quarles at their Ski shop in Place Ville Marie in Montreal. I still have aphoto of him in his unique style……. knees together and leaning forward……. Thank you Stein for allowing me a brief moment of your time. Skied with Stein, after he put on a visit skiing presentation with his famous ski flip. “Stein” was such an incredible and gracious man with his time for others. I have a photo with him that I treasure from the early 1980’s when I was still in the ski business. To me, he’s been a living legend that lived up to that status without faltering… a true hero and ‘good guy’! Over the years I’ve spoken fondly of him and others that have had the class he had in how he conducted himself and demonstrated life in a high standard. We first met Stein at Sugarbush, and really tried to use his “comma” position. Took some years. Saw him again at Snowmass, enjoyed our chat. Flyfished with him, in our float tubes, at Hidden Lake, high above Elk Lake, MT, and west of Henry’s Lake, ID, on the continental divide. Great fun with a true Gentleman, and Sportsman. “shadowing” Mr. Eriksen during his legendary afternnon sessions. Why on one occassion there were just two of us on the lift in mid-February I cannot explain. I will forever hold close to my heart the runs taken with one of the greatest sportsmen of all time, and his incomparable style ! Stein Eriksen loved the Lodge, and it will forever be my mountain home. May God bless you, your family, and your exceptional staff at the Lodge. See you soon enough on Heaven’s slopes sir. I’m certain you’re getting your runs in ! I am a Norwegian and I had lunch with him a few time, he was grate guy, I watch race in Norway in 1952 not to far from were I lived then and it was fun see him ski, he is still my hero. Bjorn Bang. My wife and I met Stein while we were having lunch at is Lodge at Deer Valley, very nice to talk to great personality he knew all,About Albany NY where we came from because of he being head of sking at Sugarbush Vt. God Bless him. 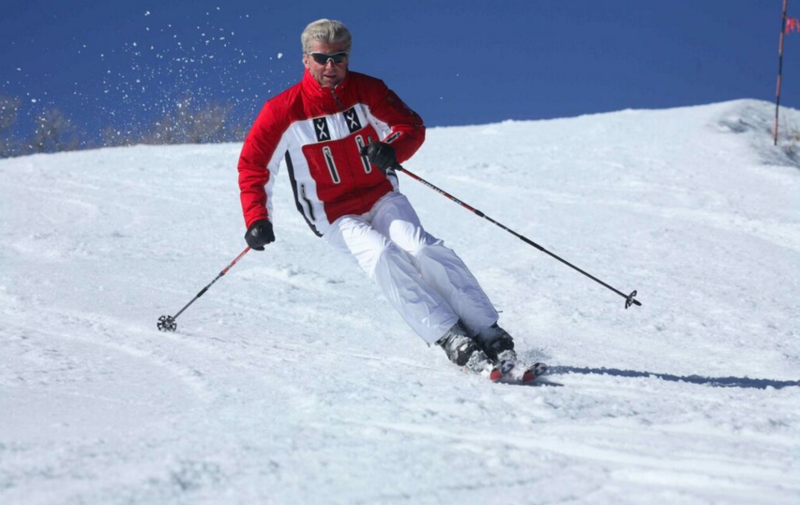 My late husband, Ole Jørgen Gilbo, of Oslo, Norway was always so proud to say that both he and his father, Odd Gilbo, were in the same sports club as Stein Eriksen – Ready- and I can still see the elegant style of “floating” down the ski slopes exemplified by all of them. The lodge is magnificent and is as elegant as these Norwegian gentlemen presented themselves! Ole often spoke of the 1952 Olypics and perhaps Mr. Bjørn Bang was also acquainted with him? In the second half of the ’60s while living in Boulder, Colorado. I was on a youth ski team sponsored by the Alpine Haus ski shop and coached by Blaze Colt. Stein did a book signing stop there for his book ” Come Ski With Me ” he spoke kindly to everyone in line. I lost the book when I was away in Vietnam. 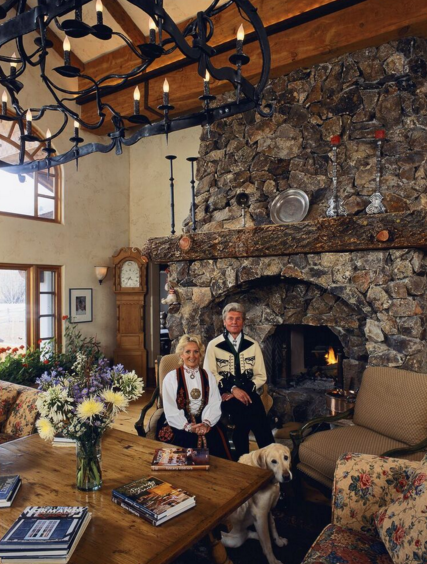 When Snowmass Celebrated it’s 20th birthday, lodges rolled their rates back to $19.68, the opening year. Lift tickets were rolled back to the first season cost of $6.50. I followed Stein around the town, bar hopping to try to get my newer copy of his book signed. Never caught up. 1968, Boulder, CO, Stein, Buddy Werner, Spider Sabich, Jean Claude, Tony Sailor. Colorado is and was a great state. 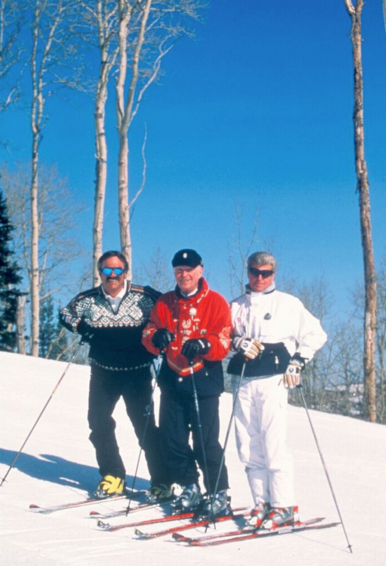 In the early 90’s I was a professional ski patrolman at Deer Valley Resort. I crossed paths with Stein Eriksen on a number of occasions. Each one was a pleasant and memorable experience. On one of these occasions, I had responded to a report of an injured skier in Ontario Bowl (a steep, double black diamond glade). Just as I finished securing the injured skier in the sled, Mr. Eriksen and a contingent of 3 or 4 guests showed up on the scene. I recognized him immediately. In his famously distinct accent he asked if he could be of any assistance. I responded saying of course he could! I handed him the tail rope and said give me enough slack so I can maneuver through the bumps and trees, and give me tension if I get going too fast. He nodded and we proceeded. We all made it down safely. Stein was phenomenal—definitely the most stylish tail-roper I’d ever had! I was on the Stanford ski team in 1958. 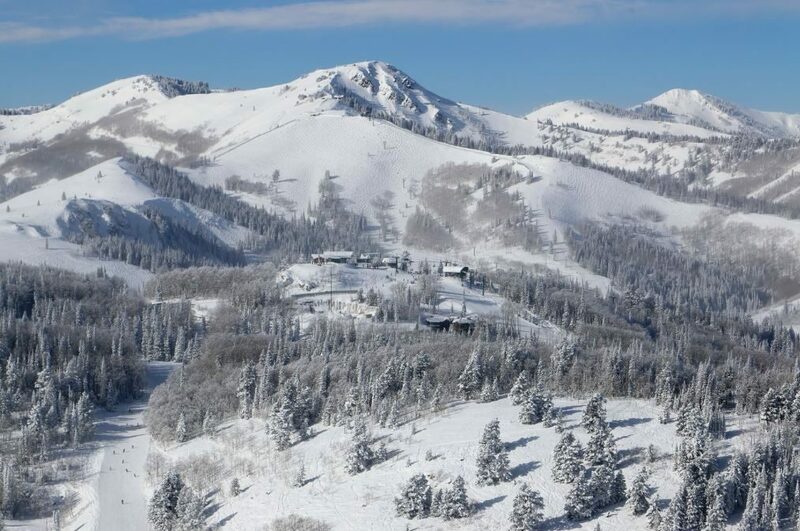 We sometimes trained at Heavenly Valley, where Stein was director of the ski school. Twice a day, Stein would come straight down the main hill, full of moguls and which I skiied with caution, in his inimitable layout, eyes to the sky position, to abruptly and meticulously stop at the edge of the outdoor dining area, flip off his bindings and go in for lunch. A true legend. One word says it all, “Stein”. Just an incredible combination of talents. Dr. Ruth Westheimer mentioned Stein Eriksen in a recent interview where she said he was a lovely man. It’s caused me to search my old photo albums where I found the photo he kindly allowed me to have taken with him at the base of a ski slope in the late 70’s. He didn’t have to do it, but he smiled kindly, briefly put his arm around my shoulders for the photo and left me feeling very happy. I was sad to learn that he has passed, but glad that he had such a long life. Mary Jane could throw at me. St winter Park where I skied most I was asked many times if I had studied with Stine Erickson Anderson no but yes . It all came together for me when I put my skis close next to one another , kept them they really used my edges and a shuttle hip movement a weighed instant to kick my heals while keeping my weight forward.. Thank you Stine for the last 40 years of skiing.!! I hated school when I was a boy. I stayed out of the library as much as possible. I was a bad kid and a bad student who would rather be on the slopes than study. But on this one odd occasion that I went to the library I stumbled on a book called “Ski Racing” (Advice by the Experts), and I was enthralled by the advice, photos, diagrams, technology and other info I found there, including several quotes and photos of the Great Stein Eriksen throughout the book. You have to remember there was no internet back then, nor abundant of publications like today, so naturally, finding this treasure and being a bad boy who loved skiing, I stole the book, which I still have to this day by the way some 50 years later. I’m certain it made me a better skier at the expense of others I’m guessing. Yes, guilty as charged. Anyway, with my adolescent criminal career behind me, about 20 years ago on a Utah Christmas week ski trip, I was thrilled to actually meet the legend, by chance, while having lunch with my girlfriend at the time in the lodge at Deer Valley – on my birthday of all days. He was gracious enough to pose with us for a photo, and when I told him I stole that book when I was a boy he smiled that big smile of his and chuckled a bit. He remembered the book and the content well and we briefly chatted about that, and the fact that earlier that morning that I raced the course that he set the pace on that day, which I didn’t realize until he told me. I was young and fit and feeling good at the time but Stein’s pacesetting course time easily beat mine by 3+ seconds, though he was in his early seventies then, and no longer racing competitively against Olympic athletes of course. Still, he said I did well and encouraged me to keep at it, which had me beaming, coming from the great ski racing legend Stein Eriksen. What a great memory that day was for me. Amazing athlete. Amazing man. Thank you Stein. God rest.